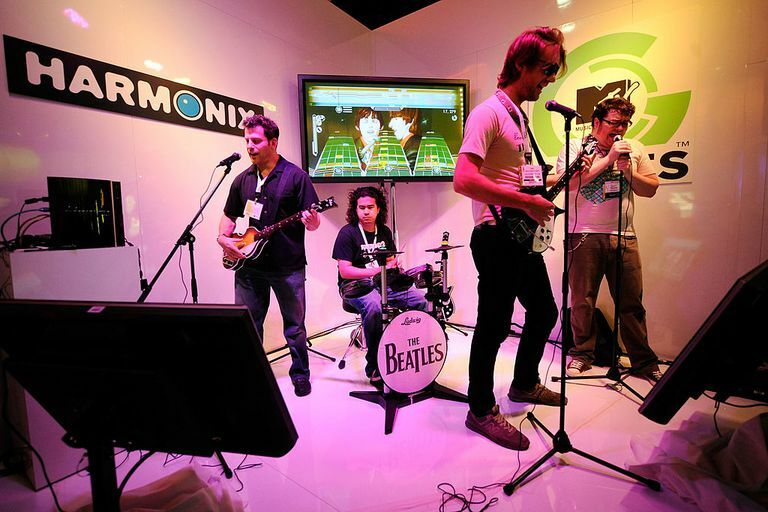 Rock Band is a series of music video games with controllers that look like musical instruments. The following Rock Band hints and tips will help you play better, regardless of your skill level. Please note, this is a series article which supports the Rock Band hub, and is geared to help you regardless of the specific Rock Band title you are playing. In fact, many of the same tips here will apply for Guitar Hero games as well. The smaller looking notes on the board can be hammered on, meaning all you need to do is slam your finger on the correctly colored fret button, you do not need to strum these notes. Initially, it may seem a bit awkward doing this, but on tougher difficulties like Hard and Expert, this will help the music flow easier, and give your strumming hand a needed break. Technically speaking, a smaller note to the right of a regular note is 'hammered-on,' while a smaller note to the left of a regular note is considered a 'pull-off.' Their execution, however, is identical. Press and strum the regular note, then slam or tap your fretting finger on the correctly colored note to hammer it. Oh, and don't forget to begin strumming again when the next regular note comes up. Learn this technique early and you'll thank yourself later. It may help you to visualize the on-screen guitar neck as a highway. Think of it this way, there is a five-lane highway in front of you, the number of used lanes varies depending upon the difficulty the game is currently set at. On Easy, you'll utilize the left three lanes (Green, Red, and Yellow). On Medium you'll also utilize the Blue lane. Up to this point, there is no need to 'switch lanes,' meaning you don't need to reposition your hand at all since your fingers can easily be prepared to press any of the upcoming fret buttons. Once you move up to Hard and Expert difficulties you then need to switch lanes, discussed in more detail below. Hard and Expert make full use of the highway, and being prepared for all the possible notes will require moving your fretting hand to the right (where your fingers are prepared for Red, Yellow, Blue, and Orange). Once you see an Orange note coming, be prepared to move to the right side of the board, or highway as visualized. Most players find it naturally comfortable to remain on the right side until there is a Green note to play. At first, this will take some practice, but soon you'll be doing it without even thinking about it. That's when you know you're ready to stick with the Hard and Expert levels and say goodbye to Medium (with the exception of certain extra-difficult songs, such as Metallica's Battery, which just takes a bit more practice). Note: During the course of these tips we refer to the Orange button, some refer to it as Brown, but we'll stick with Orange for our tutorials. This is a slightly different take on the highway visualization discussed earlier in the article (see tip two). With this method, you visualize the entire on-screen guitar neck as a tube or tunnel, with notes flowing toward you as the song plays. Having this visualization in your mind as you begin to play tends to help you be more prepared for a wide range of notes. For most gamers, the highway method will be easier to follow, but this type of approach has helped countless players that otherwise would have given up on harder difficulties. Try both methods and see which one works for you the best. Drums and vocals cannot go into overdrive whenever they want, guitar and bass can. Have a plan before beginning a song so that when the Vocalist or Drummer goes into Overdrive either the Bassist or Guitarist (or both) go into Overdrive as well. This will maximize your multiplier (both yours and the rest of the band) allowing for a higher score and make a five-star performance easier to achieve. Before you use Overdrive take a peek to the left to see how your bandmates are doing. If one or more is struggling you may want to hold off on using overdrive so you can save them, either before they fall out completely or just after. When you use overdrive you make the fans more tolerant of errors, and therefore help you and/or your bandmates stay on stage longer while struggling. Should a bandmate fall, overdrive can be used to bring them back, keep this in mind when playing. Seems like a simple concept; be prepared for the upcoming notes. As simple as it seems, a lot of musician gamers become too focused on the single notes as they pass the target line at the bottom. Instead of seeing each note as an individual, begin looking at sets of upcoming notes, and view them as different patterns. Visualizing the upcoming notes as patterns will really pay dividends when you're trying to tackle some of the tougher songs on higher levels. In addition, it might help to purposefully not look at the individual notes as they pass the target line. Instead, listen to the sounds of the notes as you play them, and continue to play the 'patterns' as they approach. Don't get caught into the trap of trying to use your pinky finger to stretch and reach the Orange button on Hard and Expert difficulty levels. It's much easier, and better for you in the long haul if you learn to move your hand according to the upcoming notes, rather than reacting to them when they're ready to be played. On faster songs rapidly moving back and forth to keep up can get confusing. Much of this tip is in how you approach the upcoming notes, even more than how you hold your hand. Keep a steady, firm grip on the guitar controller, but only use the fretting hand to hit the notes. Your strumming arm should steady the guitar slightly if needed. Just like learning the real guitar or bass, earning to play the harder difficulties will require you to be prepared for whatever notes come along, and not be surprised by any of them. The way to do this is to relax. There are several different techniques on various ways to relax, but here is perhaps one of the simplest to follow. Just before playing visualize the game on the hardest difficulty you can imagine, playing one of your favorite songs, and in your mind visualize yourself hitting each and every note in perfect timing. Do this for a couple of minutes until you feel completely relaxed, and then begin to play. That's just one method, there are hundreds, find one that works for you. Often overlooked, a correctly positioned guitar can be the difference between a five-star performance and a four-star performance. At this point, there is no reason to settle for a four-star outcome, especially because of an improperly held guitar. So here is how it should be held. Sit or stand, if sitting use a chair without armrests, if standing doesn't have the guitar down too low. The key to positioning the guitar is that it should be about perpendicular from the ground, and it should be steadied by either the strap or your knee if seated. If you're just beginning your Rock Band career, it might be a good idea to begin the game on Medium, skipping Easy altogether. Easy doesn't give you the feel that you're really into the game, and it also doesn't utilize all available fingers. The main difference is that you'll have the inclusion of Blue fret notes, and the board moves slightly quicker. Sometimes it is this extra pace and feeling of being in the game that helps a good player become a great player. If you aren't having fun, stop playing the game and do something else for a while, there's no reason to continue if you aren't having fun. Now go use these tips and become the Rock Band star you've always dreamed about! Take the time to calibrate your system. Calibration can be done automatically with guitars designed for Rock Band 2 and later. If you have an earlier version of the guitar, setting up calibration won't take more than five minutes, and it will help your gameplay instantly if calibration was previously offset. In order to calibrate your system, using the guitar controller or the drum controller go into the Options Menu, and select Calibrate System. From there just follow the on-screen prompts to finish calibrating Rock Band 2's controller lag issues.